I get lost in this hotel, forgetting which way to go to find our room. I traverse one or more of the many patios surrounding the central lobby and reception area, only to realize I went the wrong way. 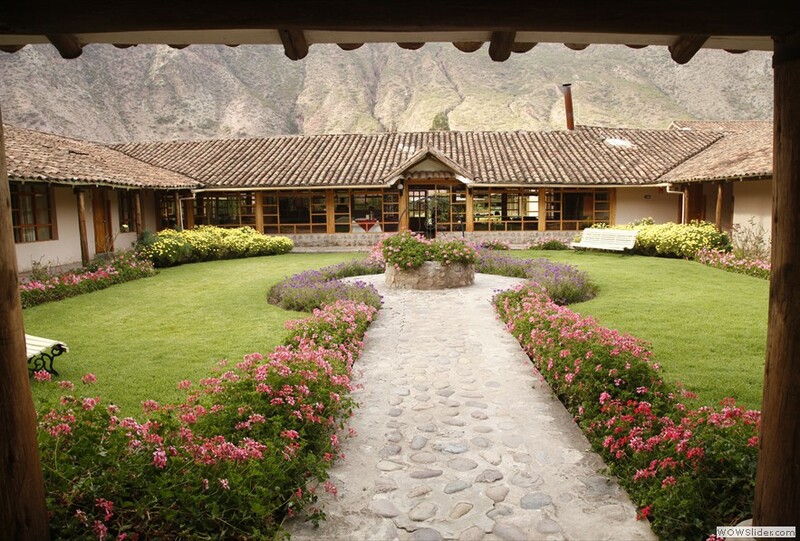 Each section of the hotel surrounds a central courtyard, with beautiful manicured flower gardens. In the lobby of the hotel, there is always coca tea ready for consumption. Coca tea is supposed to be good for altitude sickness, so we all had some. Jayme and I met a young woman, also named Jamie, who told us to put a coca leaf at the bottom of a water bottle, add a little hot water, then fill the rest of the bottle with cold water. 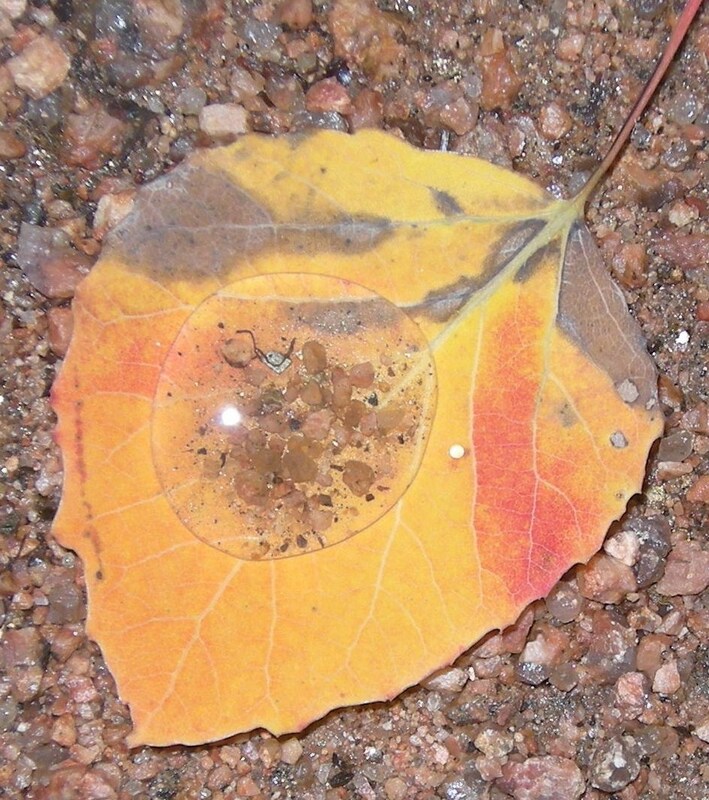 This is a good thing to take on treks, which reach an altitude of 10,000 ft. approximately here in the Sacred Valley. I tried this and discovered it makes a good sun tea, the coca leaves floating around and lending a slight greenish tinge to the water. 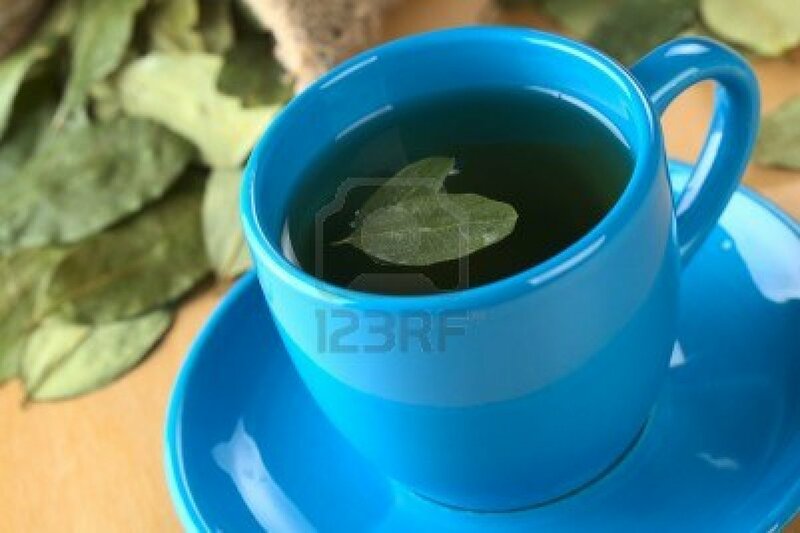 However, coca tea is better hot than cold, and since its flavor is very similar to grass, it’s also more palatable with sugar added. Coca is a leaf which is commonly harvested and used here. 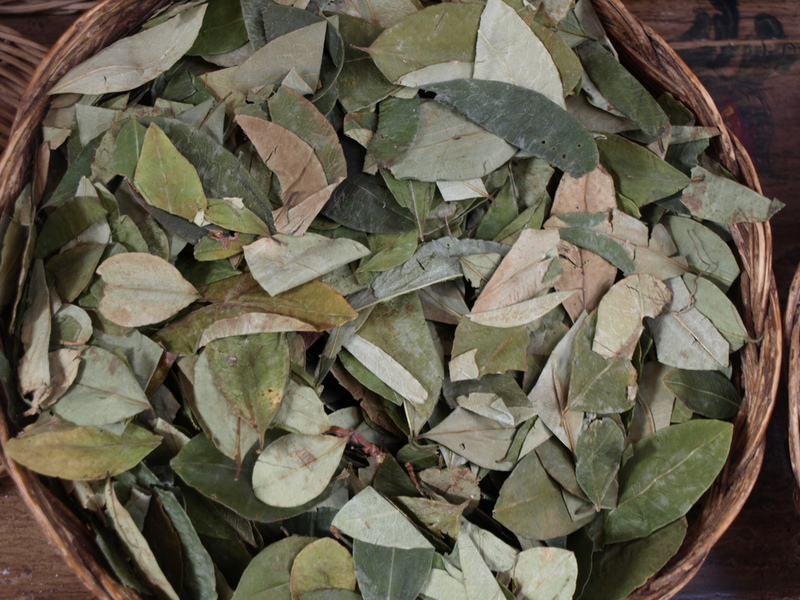 Natives chew it to alleviate symptoms of hunger, but it is common among everyone here to drink coca tea. Coca is also the main ingredient used in making cocaine, but the leaf itself and how it is used primarily, is not a drug. The American government has tried to get Peruvians to stop growing coca, a main source f income for many poor people here. The Peruvians think cocaine is an American problem, and should be dealt with in the United States, not by destroying their livelihoods. I was actually nervous about the school visit, wanting to make a good impression. When we arrived at Villa Marcelo School in Urubamba, we could hear children reciting in chorus, probably 1st graders learning to read. But first grade was not to be our destination. Boris informed us that today we were going to a 6th grade classroom. 6th graders, in some ways, are the same everywhere. were six boys and ten girls. The boys sat together on one side of the room and the girls were similarly grouped together. The room was sparsely decorated, not like American classrooms with our brightly colored posters, charts, word walls, and student work plastered on every available wall space. Here the walls are painted blue and the teacher has carefully arranged a space for each subject matter: the math space is entitled, with multicolored dyecut letters “Encontramos Soluciones Razonables” (We find reasonable solutions), under which is a small poster of a boy thinking about a multistep math sentence and another poster with several pieces of student work. The rest of the space under the math headline was blank. “Dialogando nos entendemos” (Through dialogue we understand each other) is the language arts area, under which there are many sheets of chart paper written by the teacher, as well as a few commercial posters and punctuation marks. There was also an area for Personal and Social Skills and another for Science. Most of the displays were teacher or student made. The students were ready for us, of course, and were curious. From what Boris had told us, I get the impression that the OAT tours rotate classrooms, with each group meeting a different grade level. These 16 students were the only 6th grade class. They ranged in age from 12 to 15, the teacher told us. It was hard to tell this from looking at them, since the majority of them were not very tall, including the teacher. Some of the girls are taller than the boys, but this is fairly normal for this age group. The teacher told us about the curriculum that the students study – 7 subjects, including math, Spanish, science, personal & social skills, history & geography, music, and physical education. She teaches all of these subjects including P.E. 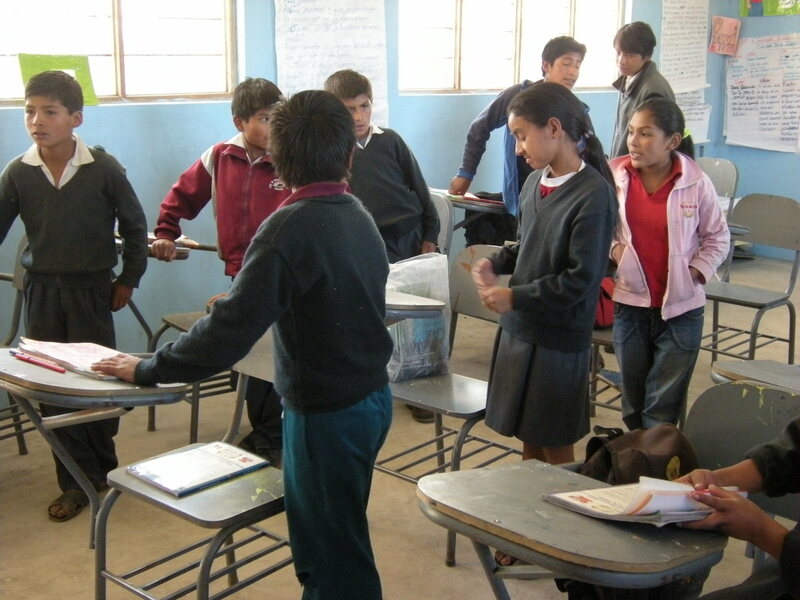 The students enjoy playing sports, and the two most popular, as in all of Peru, are soccer and volleyball. But when we asked them what their favorite subject was, the teacher told us that Personal & Social skills was the favorite of most. The students asked us our ages, to which my usual reply is to tell them it’s not polite to ask adults how old they are. However, I took a clue from Boris and the others to simply tell them honestly. Of course, Boris wasn’t honest – he said he’s 61! I couldn’t believe that – he can’t be more than 45 at most! However, by everyone telling their ages, I realized that of all the people in the group, except for Jayme, I am the youngest at 56! Another question was what we do for a living. A lot of the people in our group are retired so they told what their profession had been. Then we asked the children what they would like to do when they grow up. The most common responses were teacher and tour guide, although one boy said he’d like to be a mechanic. 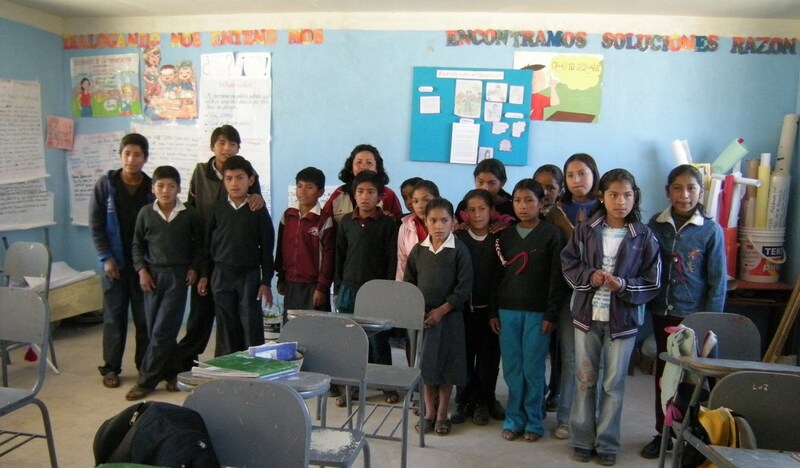 After asking each other a few questions, the class sang a song for us in Quechua. Then one girl stood up to recite a poem for us, in Spanish. I thought this was very brave of her, even though she had probably been preparing for it. Before we left, we had a chance to make some parting remarks. The teacher spoke first, expressing her gratitude for our coming. A few members of our group had some words to say also. I told them (in Spanish) that they should always remember that it is a privilege to be bilingual, (and it can help them get a job too! ), that they should always keep their traditions and be proud of who they are. Many of the girls followed us outside and we were able to take some pictures of the students with their teacher in front of the school. I had asked the teacher for the school’s address, which she wrote down for me. As we waved good-bye to them from the bus, I thought that what I would like to do is start a pen pal correspondence between my bilingual students and the students at Villa Marcelo School. I think it would be motivating for my students to do this – an authentic use of their Spanish language skills. Also, perhaps we can collect supplies to send to them. The school was very modest and sparse compared to ours. 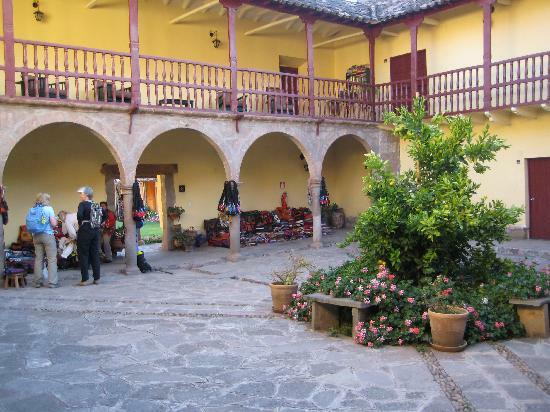 This is a small school, of course, serving the entire area around Urubamba. Some students walk miles to get to school (there are no school buses!). 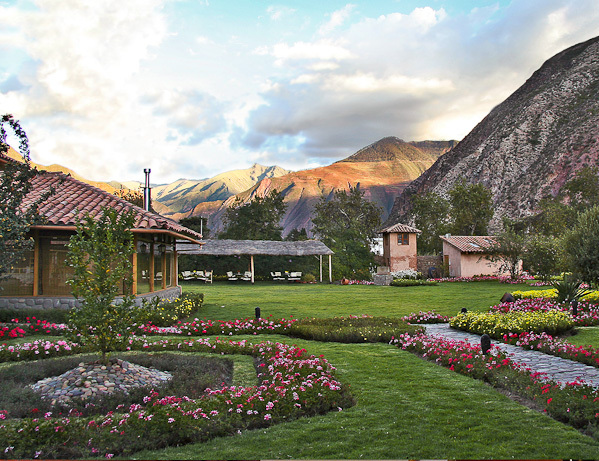 Others live on farms so far away that they have to stay with relatives or friends in Urubamba during the week or the school year. It is not hard to understand why these children take school much more seriously than our youth, and the deference and respect they show teachers and other adults. 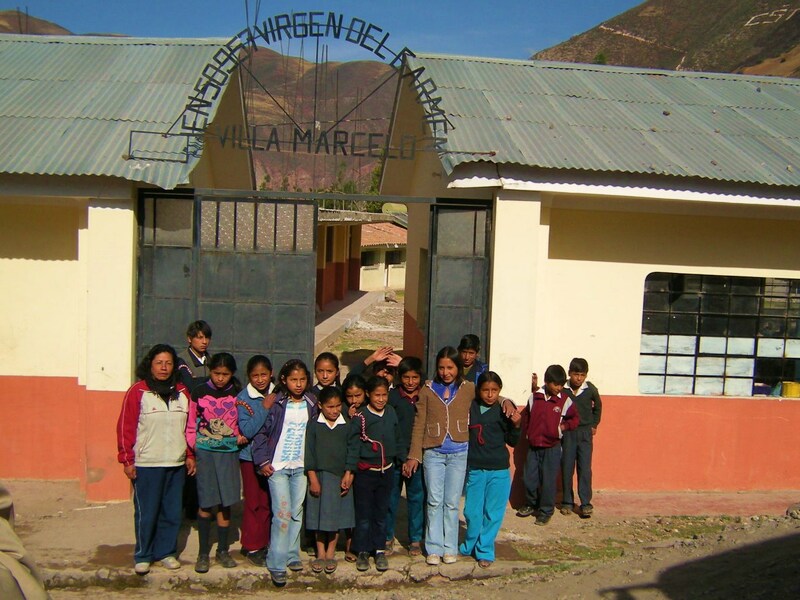 Note: In this post, only the pictures of the school in Urubamba were taken by me; others downloaded from Google.